One of the biggest myths in the workplace today is that employee satisfaction means employee are engaged. Do you know how many of your employees are engaged, satisfied, disengaged, and the financial impacts? Discover how your employees really feel about their jobs, the organization, vision and values, and leadership. You will clearly understand which factors in the workplace will have the most effect on their commitment, loyalty, effort level, and overall performance. • Compensation, Policies, Procedures and More! 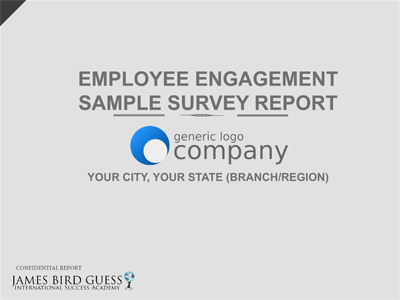 After analyzing the survey results, we devise a strategy that will guide you step-by-step to implement the necessary changes that will make a quick positive impact and ensure employees are engaged to perform. Measure employee engagement with a five minute survey using eleven critical questions. Obtain employee feedback anonymously with our fast online response system. View real-time response rates, charts, and receive James Bird Guess’ best practices for engagement. Senior level leaders will receive expert recommendations based on organizational strategic priorities and goals. We work with your leaders to build a customized after-survey action plan. Learn how to respond to negative feedback and best practices for Great Places to Work organizations. Call us now at 888.369.1339 or email info@internationalsuccessacademy.com to discover how we can create a customized engagement survey, after survey action plan, or enhance your employee surveys to equip your leaders to excel.